You can add notes to each slide in a Storyline course. Use notes as scripts for recording narration, or make them visible in your published output as transcripts, supplemental information, or written instructions. To open the notes panel, switch to Slide View, then click the Notes tab at the bottom of the screen. If it isn't visible, click the arrow in the lower right corner of the slide stage to open the timeline, states, and notes panels. To add notes to a slide, just type your text in the notes panel, or copy and paste text from another source. Tip: When you import a PowerPoint presentation or another Storyline project that has slide notes, those notes will also be imported into your new project. Tip: The default colors for text and background match the player colors as they'll appear in your published output. This makes it easy to format notes the way you want. See below for details. The default text color for slide notes is controlled by your player properties. And you can see what that color is without opening your player properties. Just enter some text in the notes panel. When you use the modern player style, your slide notes will either be black or white. When you use the classic player style, the default text color can be anything you want. (You can always override the default color on a slide-by-slide basis using the font color selector on the Storyline ribbon.) Here's an example of how notes might look in the Storyline editor and in the published output. When the player properties open, click Colors & Effects on the ribbon. Choose either the dark or light player theme. Click OK the save your changes. Click Show advanced color editing. From the Edit item drop-down, select Editor >> Text. Use the Color selector to choose a theme color or standard color. If you don't see the color you want, use the Eyedropper to match a color from anything visible on your screen or click More Colors to choose a custom color. The notes panel in the Storyline editor has the same background color as the notes tab in your published output. Choose the color you want in your player properties. When you use the modern player style, the notes panel is either black or white. When you use the classic player style, it can be any color you want. From the Edit item drop-down, select Menu >> Background. Go to the Home tab on the ribbon and click Player. When the Player Properties window opens, mark the Notes box. 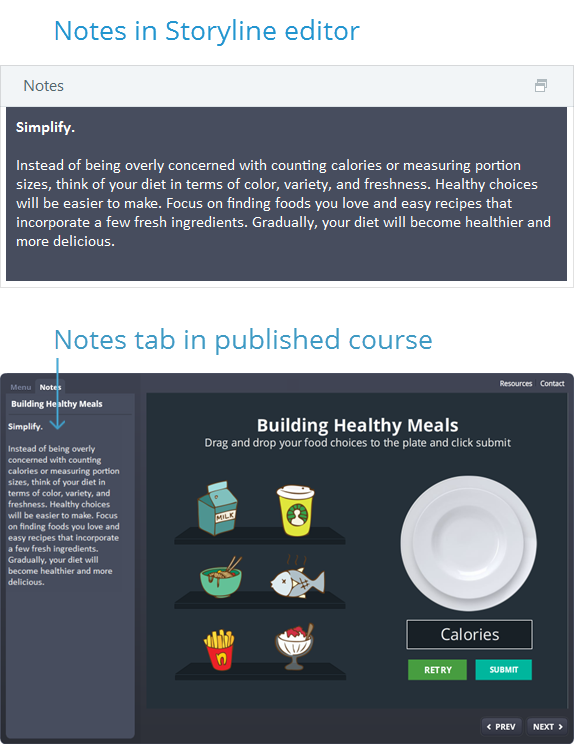 By default, the notes tab will display in the sidebar of your published course, but you can use the up and down arrows to move it to the topbar. When you're finished, click OK to close your player properties. To learn more about customizing the player, see this user guide.